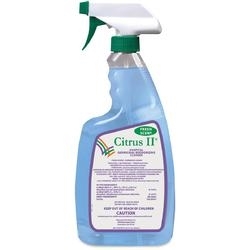 This hospital-grade germicidal cleaner is effective in disinfecting against viruses, bacteria, mildew, fungus, and meets OSHA standards for fighting bloodborne pathogens without any bleach or abrasives. It features a fresh, lavender scent. Made in the USA. 22 fl. oz. spray. Also available in an economical gallon size for salon cleaning!